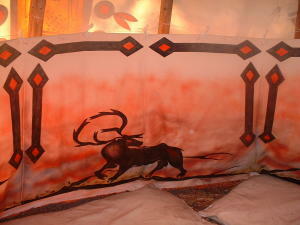 When the teepee is installed, the fabric of the teepee is about 10-15 cm up the ground so the fire can be feeded in air and is not in contact with the ground then, with ground's humidity. The liner is installed in the teepee and is completely touching the ground. This then let an air draught channel between the exterior fabric and the liner. This disposition protects the persons who sleep in the teepee from air draught in the same time that it lets the fire being air feeded and let the smoke going out by the chimney. The liner conceived by Teepee Tseiwei is made with the same fabric than the exterior of the teepee but has a «fabrine» fabric (synthetic material) installed at the bottom. This prevents humidity and mildew to contact the liner's fabric. 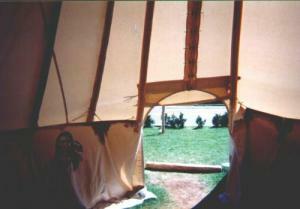 NOTE : It is not necessary to install a liner when a wood stove is used in the teepee. It is then recommended to install a synthetic material band at the bottom of the teepee to prevent air draught that could disturb people in the teepee. NOTE : If you want to make the liner of your teepee by yourself, Teepee Tseiwei can provide you with the drawing to make it.